Editor’s Note: this article was originally published in 2018. It has been updated with relevant information for 2019. Single Customer View (SCV) is a term that has been bandied about in marketing circles for over a decade. However, it’s hard to lock down a universal definition due to other variables (how the data is sourced, the speed of profile updates, etc.) that are often overlooked or omitted. What Does Single Customer View Mean in 2018? With customers purchasing from multiple different devices, and the move toward omni-channel communication, a method of cataloguing all that data is required. At its simplest, a Single Customer View is a database with customer profiles (purchase history, site activity, product recommendations) for every individual person. A true Single Customer View is that customer database, but scalable, flexible, and updated in real-time. This last point is a crucial difference. SCV data is used to enable segmentation and marketing automation; if the system is out-of-date, your customers could be seeing the wrong messages. Despite this, many companies with a rigid framework and time-delayed updates still discuss their Single Customer View as though it’s the same thing. This article will explore the history of customer data management that led to the Single Customer View, the importance of having one, and actionable examples of a true Single Customer View in use. It’s not only about building the Single Customer View, but about having the ability to really use it in a way that makes it beneficial and profitable. 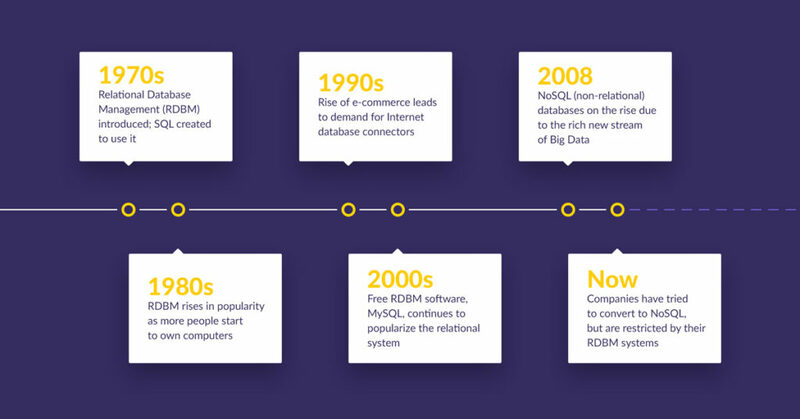 In the 1970s, companies began storing their customer data using Relational Database Management (RDBM) systems. These systems allowed companies to store data as individual pieces of information in different fields (first name, last name, customer ID), and then access that data through SQL queries. As the popularity of computers continued to climb, this method of managing customer information became the standard. The internet continued to grow, and companies continued to invest in their RDBM systems. These systems could still handle the customer information being gathered, and most companies saw no need to change their methods. Until about 2008 – when Big Data started hitting hard. The amount of customer info that could be gathered increased exponentially, and the formerly superior RDBM systems could no longer efficiently handle all the details. The idea of a Single Customer View was born then out of necessity. Customer data was far richer and more detailed than ever before. Customers were starting to make purchases from all different directions: in-store purchases, phone, tablet, PC. All that customer data was going to different places, often managed by different departments, and even using different software. There was no way to effectively track the customer throughout their lifecycle, and communicate with them in a relevant way. NoSQL databases began to be seen as the solution. NoSQL is built to handle large amounts of unstructured data. It’s more flexible, scalable, and faster than SQL when dealing with something like Big Data. Unlike SQL, NoSQL systems can track any piece of data at any time, with no need to prepare the structure for it. New data sources can be tracked without the need to set anything up. In short, NoSQL was better for using the data these companies now had access to. Unfortunately, decades had been spent building Relational Databases– countless man hours and piles of cash – and this widespread system was now showing its limitations. In addition to the previously mentioned issues of collecting more detailed data and customers that connect through multiple devices, all methods for the company to interact with customers were disconnected as well! Customer Relationship Management (CRM) systems were in one data silo, email management was in another, analytics in a third, and on and on. The Legacy companies that had invested early on (Oracle, IBM, Emarsys) were now at a disadvantage. With all the time and money spent on their now out-of-date RDBM systems, they couldn’t just start over from scratch. Instead, they tried to convert their Relational Databases into Non-Relational Databases (NoSQL). This required pushing together a number of different data silos and pointing them all in the direction of the customer, hardcoding something that looks like a Single Customer View, but doesn’t function with the same flexibility or speed. Adobe tried a different approach: rather than build their own SCV, they purchased several companies that were each working on a different part of the technology and hacked them all together into Adobe Marketing Cloud. This works to a point, but as the systems were all built separately, they don’t work as well together as a whole. This stumble on the part of market leaders allowed for market disruptors like Exponea to introduce new solutions. How Did Exponea Solve the Single Customer View? Exponea’s Single Customer View is representative of all the data in Exponea, in real-time, granular and customized. In order to process individual granular data entries our platform sits on an In Memory Framework that runs all calculations in milliseconds, meaning that all segmentations and customer calculations are always up to date. Rather than altering existing tech to face a new problem, Exponea had the opportunity to look at the problem first, then create the tech around it: a customer is interacting with my company right now; I need to qualify them and take action. This approach allowed Exponea to create a truly customer-centric system; an all-in-one platform built around NoSQL, rather than one adapted to work around the limitations. CRM system, Email management, campaign building and automation, real-time predictions, analytics, etc. all available within one dashboard. With data updating so fast you can actually watch a customer profile update itself as the customer clicks around. And it’s not just about speed. The flexibility of this customer-centric system, built around NoSQL and using In Memory Framework, creates new opportunities for communicating with customers. With a system parsing each individual action that every customer takes, in real-time, Exponea has been able to develop powerful customer recommendations that adapt and interact with the customer, even as they browse the site. Legacy Database: You’re dropped in the ocean, and you manage to scrape together a raft from what’s floating around you. It keeps you from drowning for now, but it’s not ideal. Exponea: You’re given a boat designed for the ocean. Not only does it keep you afloat, it’s the optimal method for navigating the seas. Finally, another advantage of an all-in-one platform is how quickly the software can be implemented. Exponea’s basic software can be set-up and running within days. The most bare-bones version can be installed in minutes, as it only requires a single code integration. Compare that to the weeks or months required to integrate all the disparate parts of a Legacy company. Why is a Single Customer View Important in 2018? We’ve talked a lot about what a true Single Customer View is and what the differences are between companies. This section will show the importance of achieving a true Single Customer View through examples of its actionable use. One of the most important (and underutilized) tactics to improve open rates and conversions is to send the email at the right time for that customer. When Exponea began working with fashion retailer Missguided, one of their goals was perfecting optimal send times. Within seven days they were up and running, able to send over one million emails to customers. Using Exponea’s real-time predictive analytics, Missguided was able to automate their emails to send at the optimal time for each individual user, leading to an uplift in open rates, click-through rates, and conversions. The flexibility of a true Single Customer View also makes it simple to create custom tools within the software. For Missguided, an html editor and custom fonts were built to their specifications. Watch this video to learn more about Exponea’s work with Missguided. A true Single Customer View should be capable of personalizing every stage of a customer’s lifecycle; something customers are now starting to expect. When Exponea started working with fashion retailer Eye for Fashion, the main focus was to increase conversions on the website. Exponea’s analytics tool searched Eye for Fashion’s data to identify which customers were most likely to buy. These customers were targeted based on their history with the site (through use of Exponea’s recommendation engine). This group was then segmented, and each segment was shown a different, highly personalized banner, testing each stage of the customer journey: recommendations, view count banners, exit banners, cart abandonment banners, etc. Using Exponea’s tool for A/B test creation and measurement, Eye for Fashion was easily able to identify their most successful banners. Read a Success Story about Exponea’s work with Eye for Fashion. Companies with diverse customer bases and numerous products often have trouble communicating with their customers. They can’t design a homepage message that works for everyone, and creating hundreds of different, changing versions would be impractical without the right tools. This was the challenge that mobile carrier T-Mobile.cz was facing when they started working with Exponea. Using Exponea’s segmentation capabilities, they developed multiple micro-segments of customers. Now when a customer visits the site, Exponea identifies them, checks their micro-segment, and updates the homepage to display relevant content. This all happens while the homepage is loading. Read a Success Story about Exponea’s work with T-Mobile.cz. In the simplest sense, a Single Customer View is a database of customer profiles (one for every user), composed of purchase history, site activity, product recommendations, etc. NoSQL (Non-Relational) Databases are superior to Relational Databases when dealing with large sets of detailed data (i.e. Big Data). Not all Single Customer Views are equal – most Legacy companies run theirs on converted Relational Databases, creating a slower, less flexible Single Customer View than one built around a NoSQL database from the beginning. Exponea’s Single Customer View is built around NoSQL. It’s flexible, updates in real-time, and combines CRM, email management, campaign building and automation, real-time predictions, analytics, and more into one main dashboard. Could your company grow faster with a true Single Customer View? See for yourself.